Jeopardy host Alex Trebek with Ken Jennings after Jennings broke the $1,000,000 mark. It started innocently enough. Ken Jennings, a baby-faced computer engineer, printed the phrase “Who is Jones?” onto his Final Jeopardy lightbox. Jennings, who had bet $17,201 of the $20,000 he had earned during the first two rounds, clenched his teeth nervously — and then exhaled once host Alex Trebek confirmed that the answer was correct. Instead of being relegated to third place, Jennings became a “Jeopardy!” champion for the first time. He’d do it 73 more times after that, the most ever. For those six months in 2004, Jennings put together an unassailable streak unlike any other in any competition. We don’t make a ton of promises at FiveThirtyEight — the nature of forecasting is that something unexpected is bound to happen one of these days. 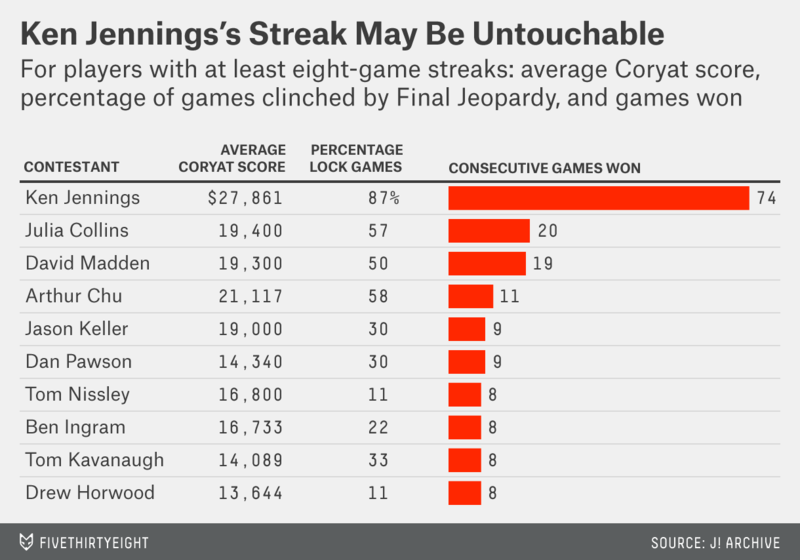 But after going through the Internet’s “Jeopardy!” databases — yes, there are several — and talking to former champions, I can say this: It’d be a near-miracle if somebody beat Jennings’s streak. Here’s why. If you were to design a long-term “Jeopardy!” champion, he or she would probably be a lot like Jennings: someone who is not only incredible at trivia but also has the stamina to make it through a grueling schedule and can wrap up a game before it even reaches the final round. Julia Collins, whose 20-game winning streak is second to Jennings’s, pointed to a cluster of five-, six-, and seven-game winners and noted that only 10 contestants have won more than seven games. “Jeopardy!” tapes up to five episodes a day, and while Collins was reluctant to hypothesize reasons for the cluster, she noted that most of those five-, six- and seven-time champs hadn’t had a chance to recover over a weekend. Eleven-time winner Arthur Chu is more direct about why he couldn’t keep his streak going. “It was fatigue,” he said. “One of my opponents said I looked punch-drunk. … You could definitely tell I was making dumb mistakes.” Chu’s streak ended on the last day of taping for the week when he lost the second game of the day. “There’s a possibility that if I had won the next three games that day, I would have gotten over the hump,” he said. Taping would have resumed the following week. Former champions describe Jennings as unflappable and robotic; while they worried about burning out, Jennings described the morning “Jeopardy!” orientation, when producers explained the rules to the newbies, as a mantra that soothed him. Unlike Chu, Jennings wasn’t overly aggressive in his style of play, and he never seemed to press; in fact, he frequently left money on the table by underbetting on Daily Doubles. Thirty-eight games into his streak, Jennings ended Season 20 of “Jeopardy!”1 on a thunderous note, correctly answering 44 of the 60 clues and setting the “Jeopardy!” single game cash record with $75,000. His competitors combined for just $3,000. During the next month and a half, while the show was off the air, the producers instituted a major change: more rehearsal time for new contestants. The new policy stated that the game couldn’t start until every contestant had successfully outbuzzed his competitors in real game-play conditions. According to Jeopardy executive producer Harry Friedman, the change was unrelated to Jennings’s streak. Buzzer dominance — or mojo, as Jennings calls it — is hugely important and takes a little while to get the hang of. While contestants are told to wait for a signal light to go on before trying to buzz in, the champions almost always time their buzz-ins to the end of Trebek’s reading of the clue. But they have to be careful — buzz in too early, and they’re locked out for a crucial half-second. “Almost all the players know almost all the answers almost all the time,” Jennings said. “If you’re watching at home, the illusion of a dominating player is his timing on the buzzer.” The stats back him up: According to the almost frighteningly detailed site Ken Jennings Detailed Statistics, Jennings buzzed in before either of his competitors on 61.5 percent of the clues he saw during his “Jeopardy!” run. Although Jennings went on to win an additional 36 games after the buzzer change, his dominance declined. His Coryat score — which shows what his score would be if there were no Daily Doubles or Final Jeopardy — dropped more than $1,600 during the show’s 21st season, likely because of better buzzing from his competitors. And when Jennings went up against IBM’s Watson in a special competition, the computer’s biggest advantage was not its knowledge base but rather an optimized buzzer timing, which allowed it to ring in even faster than Jennings when both knew the answer. Watson ended up destroying the people’s champion by more than $50,000 over a two-game tournament. For Jennings to get on “Jeopardy!” he had to travel to Los Angeles to take a qualifying test. In 2006, though, “Jeopardy!” instituted an online test to expand its demographic and geographic reach. Friedman told me that it also opened up access to contestants who “may have been intimidated to audition in person.” With a big barrier to entry lowered, applications were up, according to “Jeopardy!” spokeswoman Alison Shapiro. One possible consequence of the online test: Almost half of returning champions this season have been women. In the year before Jennings’s streak, fewer than 1 in 3 winners were female. Assuming the test stays the same and the same type of male contestants (which is to say, those who think they should be on a game show) are still competing, it seems likely that the reason more women are winning is because the quantity and quality of the women on the show are better. With a bigger, higher-quality applicant pool, winning streaks are that much harder to sustain. Every “Jeopardy!” game ends with contestants scrawling on their lightpads as the Final Jeopardy jingle plays. The final clue is often much harder than those in the first two rounds, but much of the real work comes before it’s even revealed. That’s because a whole field of game show game theory has sprouted. The central question: How much should a player bet, given the financial positions of his competitors? To maximize his chances of winning, the thinking goes, a contestant in second place after Double Jeopardy should (generally) make his wager assuming the first-place contestant gets Final Jeopardy wrong and the third place contestant doubles his money. And a riskier strategy of profit maximization doesn’t just happen during Final Jeopardy. Six-time champion Roger Craig routinely bet all his money during Daily Doubles, a strategy that won him tons of money throughout his “Jeopardy!” appearances but ultimately cost him last year’s Battle of the Decades title after he wiped out twice. As their fellow contestants get better, some champions decide to go for the money rather than try to hold on as many days as possible. “I never felt like, ‘I’m so much better at this than other people,’ ” Ash said. “It’s a crapshoot.” Which made her much more likely to roll the dice. But before we get carried away with Jennings’s dominance, let’s talk about Brad Rutter. Rutter — a five-time champion from 2000, before winners were allowed to carry on indefinitely — has never lost a “Jeopardy!” match to a human (damn you, Watson!) and has defeated Jennings — twice! — in tournament play. While we don’t know how Rutter would hold up over months of game play, we do know that Jennings is lucky he didn’t run into someone of Rutter’s skill level during his streak. But a little bit of analysis suggests that Jennings also got lucky against his actual competitors. Despite his dominance during the first two rounds — remember, he had locked down 87 percent of his games after Double Jeopardy — Jennings was only pretty good at Final Jeopardy. While a 2011 analysis in Slate found that the average player gets Final Jeopardy right 49 percent of the time, Jennings got 68 percent right. Combine all of that information, and Jennings should have won 97.9 percent of the games he played.2 So we (or, more precisely, FiveThirtyEight’s lead lifestyle writer Walt Hickey) ran a simulation that flipped a weighted coin with a 97.9 percent chance of landing on a Jennings win. Every time it did, we “flipped the coin” again. We did 1 million of these simulations. The average3 length of the streak was just — just! — 47 Jennings wins in a row. The simulation said that a player of Jennings’s caliber would win 74 or more times in a row 21 percent of the time. Key phrase: of Jennings’s caliber. Each season contains about 230 episodes. We’re currently in Season 31. Here’s how we figured this out. We assumed that Jennings headed into Final Jeopardy with at most one other player in contention to win. Then we assumed that in order for Jennings to lose, this sequence of events has to happen: The game must not be locked up, Jennings must get the Final Jeopardy question wrong, and the other contender must get it right. We used his stats across all 75 of his games, not just his 74 wins, to better reflect his overall skills. The probability he doesn’t have the game locked up is 13.3 percent, the probability he gets Final Jeopardy wrong is 32 percent, and the probability the other contender gets it right is 49 percent. When we combine these probabilities, we see that Jennings only has about a 2.1 percent chance of losing.